Difference that passes between who calls the Divine Will in her acts, and between who does good works without Him. 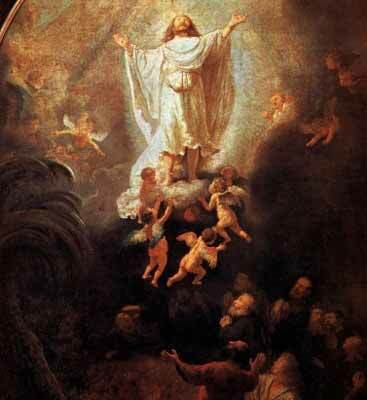 The Ascension; how he departed for Heaven and remained upon the earth. “My daughter, there is no comparison (between) the one and the other, the first one with calling my Will in her acts, strips herself of that which is human and forms the void in her human volition where to give the place to mine, mine embellishes, sanctifies, forms his light in that void, then he pronounces his Creative Fiat, and calls to life his divine work in the human one and the creature not only participates, but remains proprietor of the Divine act, which possesses the power, the immensity, the sanctity and the Divine value, that never becomes exhausted. Therefore in whom lives in our Volition, we look and we find ourselves and our acts that honor us and crown us. “Instead those that do good works, but not animated by our Volition, we don’t find ourselves, but the finite act of the creature, and since we ourselves don’t know where to hold anything of whatever good that they do, we give them the merit as payment, payment is not property that she can always produce, hence they symbolize those that live to the day, that live however difficultly from the payment that they have, but they are never made rich, they always feel the need of being paid (for) their works in order to live, and if they don’t work, they go through perils of dieing of hunger, that is to not feel the satisfaction of the good, the life of the virtues, but the squalid misery of the passions. “My blessed daughter, there is not(hing) drawn from my life that doesn’t symbolize the kingdom of my Divine Will, in this day of my Ascension I felt victorious and triumphant, my sufferings were already finished, rather I left my sufferings suffered already, in the midst of my children that I left upon the earth, for help, for strength and for support, and as refuge where to hide in their sufferings, in order to draw from my heroism in their sacrifices, I can say that I left my sufferings, my examples and my Life itself, as seed that growing and maturing itself the kingdom of my Divine Will should arise. So that I departed and I remained, I remained in virtue of my sufferings, I remained in their hearts in order to be loved, afterwards my Most Holy Humanity went up to Heaven, I felt more pressed (by) the bond of the human family, hence I would not be adapted to receive the love of my children and brothers, that I left upon the earth, I remained in the Most Holy Sacrament in order to give myself continually to them and they to give themselves to me, in order to have them find the rest, the relief and the remedy to all their needs. Our works don’t suffer mutability, that which we do one time we always do. “Beyond this in this day of my Ascension I had double crowns, the crown of my children that I brought with me into the Celestial Country, and the crown of my children that I left upon the earth, they symbolized the few that will have beginning of the kingdom of my Divine Will; all those that saw me ascend to Heaven they received so many graces, that everyone put forth (their) life in order to make the kingdom of the Redemption known, and they cast the foundations in order to form my Church, in order to make gathered in her maternal womb all the human generations, thus the first children of the kingdom of my Will, they will be few, but the graces will be such and so many with which they will be invested, that they will put forth (their) life in order to call everyone to live in this Holy kingdom. A cloud of light invested me, which took my presence away from the sight of my disciples, whom remained as statues in watching my Person, that such was the enchantment of my beauty, that it held their pupils enraptured, so much so that they didn’t know how to abase them in order to look (to) the earth, so much so that there was needed an Angel in order to shake them and to make them return to the Cenacle. “Also this (is) symbol of the kingdom of my Volition, the light will be such and so much that it will invest his first children that will carry the beauty, the enchantment, the peace of my Divine Fiat, in a way that they will easily surrender themselves to want to know and to love a good so great. Now in the midst of the disciples there was my Mama, that assisted in my departure for Heaven, this it is the most beautiful symbol. So that She is the Queen of my Church, assists it, protects it, defends it. Thus she will sit in the midst of the children of my Will, She will be always the engine, the life, the guide, the perfect model, the Majesty of the kingdom of the Divine Fiat that is so much to her heart, they are her anxieties, her ardent desires, her deliriums of Maternal love, that she wants her children in earth in the kingdom where She lived, she is not content that she holds her children in Heaven in the kingdom of the Divine Will, but she also wants them upon the earth, she feels that the assignment given her by God as Mother and Queen she has not completed it, her mission is not finished, up to such that the Divine Will doesn’t reign upon the earth in the midst of creatures. She wants her children that resemble her and that possesses the inheritance of their Mama. How one who lives in the Divine Fiat is the narrator of the divine works. The Ascension. The reason why Jesus did not leave the Kingdom of the Divine Will upon earth. Continuing in my usual abandonment in the Divine Fiat, I was following the acts of It in the Creation. It seemed to me that, by uniting myself to Its acts, I would do now an act of light, now an act of immensity, now an act of power, and so on and so forth. But while I was doing this, my always lovable Jesus, moving in my interior, told me: “My daughter, one who lives in my Divine Will and follows Its acts is the narrator of all Our works. So, as you go around in the sun to repeat together with my Will what I did in creating the sun, you act for Us as the narrator of the story of its light; and the Supreme Being, in hearing all the story of the sun – what it encloses, the good it does – being repeated to It by you, feels all the glory of its light being given back to It. And as the light shines over all things, invests everything, fills the air, It hears your echo near and far, down below and in the height of the heavens; and whispering to Our ear, you act for Us as the narrator of the light, and glorify Us so much as to give Us a sun of glory. I was thinking of when my sweet Jesus went back to Heaven in His glorious ASCENSION, and therefore of the sorrow of the Apostles in remaining deprived of such a great good; and my sweet Jesus, moving in my interior, told me: “My daughter, the greatest sorrow for all of the Apostles, in their entire lives, was to remain deprived of their Master. As they saw Me ascend to Heaven, their hearts were consumed with the pain of my privation; and much more sharp and penetrating was this pain, since it was not a human pain – something material that they were losing – but a divine pain: it was a God that they were losing. And even though I had my Humanity, as It resurrected, It was spiritualized and glorified, therefore all the pain was in their souls; and penetrating them completely, it made them feel consumed with grief, such as to form in them the most harrowing and painful martyrdom. But all this was necessary for them. Your life can be called a continuous pain of losing Me and a continuous joy of acquiring Me. But between the pain of the loss and the joy of acquiring Me, how many surprises have I not made you? How many things have I not told you? It was pain and the painful martyrdom of losing Me to prepare you and dispose you to hear the sublime lessons on my Will. In fact, how many times it seemed to you that you had lost Me, and while you were immersed in your harrowing pain, I would come back to you with one of the most beautiful lessons on my Will, and I would make the new joy of gaining Me come back, to dispose you once again to the piercing pain of my absence? I can say that the pain of remaining deprived of Me has delivered within you the effects, the value, the knowledges, the foundation of my Will. Your letter brought me great contentment, especially in hearing that you want to strip yourself of the mourning clothes of the human will; and I briefly answer to your difficulties. To live in the Divine Will is not so difficult as you and others believe, nor does sweet Jesus want impossible things, nor can He teach difficult things; rather, in all He teaches, His love is so great that not only does He facilitate His teachings, but in order to make all that He wants and teaches easier, He puts Himself at our disposition, doing together with us all that He wants and teaches. My daughter, everything is in a strong, firm, constant resolution to deliver our will into the hands of Jesus, so that His Will may underlie each one of our acts. Therefore, in all our being, in the most natural acts of life – in food, in sleep, in sufferings, in prayer, and also in legitimate pleasures, the Divine Will must have Its royal place, Its field of action, and our will must be the ground in which to receive these divine acts, and the footstool on which the Divine Will must place these acts; and these acts, united together, will form its Life. Life cannot be formed with one single act, but with many acts, repeated and incessant. Moreover, the love of Jesus, His sighs and also His tears for desire that His Will reign in us as life, are such that He never leaves us alone; He Himself descends into the depth of our will; He molds it, strengthens it, purifies it, prepares it, and does all that we do together with us. So, if we want it, everything is done; however, it is not that we must no longer feel our will: to operate on a dead will would be neither ours nor Jesus’ victory. The dead are buried. Therefore Jesus wants our will alive, so that it may feel all the good, as His operating Will lays Its acts in it. The human will becomes the residence of the Divine, and gives It all the freedom to dominate and to do whatever It wants. The Hour of the Triumph. Apparitions of Jesus. The Fugitives cling to the Virgin as the Ark of Salvation and Forgiveness. Jesus departs for Heaven. Admirable Mother, here I am again on your maternal knees, to unite myself with you in the feast and triumph of the Resurrection of our dear Jesus. How beautiful is your appearance today – all loveliness, all sweetness, all joy. I seem to see you risen together with Jesus. O holy Mama, in so much joy and triumph, do not forget your child. Enclose the seed of the Resurrection of Jesus in my soul, so that, by virtue of It, I may fully rise again in the Divine Will, and always live united with you and with my sweet Jesus. Blessed child of my maternal heart, great was my joy and my triumph in the Resurrection of my Son; I felt reborn and risen in Him. All of my sorrows changed into joys and into seas of grace, of light, of love, of forgiveness for the creatures – and laid my maternity, with the seal of my sorrows, over all my children, given to me by Jesus. Blessed child, you know that I was present at the Resurrection of my Son. But I did not say a word to anyone, waiting for Jesus Himself, to manifest Himself as risen, gloriously and triumphantly. The first one to see him risen was the fortunate Magdalene; then the pious women. And all came to me telling me that they had seen Jesus risen, and that the sepulcher was empty; and I listened to all; and with an air of triumph I confirmed all in the faith of the Resurrection. By the evening, almost all of the apostles had seen Him, and all felt triumphant at having been the apostles of Jesus. What change of scene, dear child! – symbol of those who have first let themselves be dominated by the human will, represented by the apostles who run away, abandoning their Master; and their fear and fright is such that they hide, and Peter reaches the point of denying Him. Oh, if they had been dominated by the Divine Will, they would never have fled from their Master, but, courageous and triumphant, would never have departed from His side, and would have felt honored to give their life to defend Him. Now, dear child, my beloved Son Jesus spent forty days, risen, on the earth. Very often He appeared to His apostles and disciples to confirm them in the faith and certainty of His Resurrection; and when He was not with the apostles, He was with His Mama in the cenacle, surrounded by the souls who had come out of Limbo. But at the end of the forty days, Jesus instructed the apostles, and leaving His Mama as their guide and Teacher, He promised us the descent of the Holy Spirit. Then, blessing us all, He departed, taking flight for the vault of the heavens, together with that great crowd of people who had left Limbo. All those who were there, and they were a great number, saw Him ascend; but as He got up high, a cloud of light removed Him from their sight. Now a little word to you, dearest child. All that you have heard and admired has been nothing other than the power of the Divine Will operating in me and in my Son. This is why I so much love to enclose in you the life of the Divine Will; It is an operative life, because everyone has it – but the majority of them keep It suffocated and to their service.. And while It could operate prodigies of sanctity, of grace, and works worthy of Its power, It is forced by the creatures to remain with folded arms, without being able to display its power. Therefore, be attentive, and let the Heaven of the Divine Will extend within you, and with Its power, work whatever It wants, and however It wants. The soul is present at the ASCENSION of Jesus, and asks to be able sing, always, her loving refrain: “May the Kingdom of your Divine Will come upon earth”. My risen Jesus, my “I love You” follows You in all the acts You did as risen, in the midst of your disciples. I call Heaven and earth to accompany You in your ascending into Heaven when, triumphant, You opened Its doors, which had been closed for many centuries to poor humanity. I place my “I love You” upon those eternal doors, and I ask You, for the sake of that blessing which You gave to all your disciples who were present at the feast of your ASCENSION into Heaven, to bless all human wills, that they may know the great good of living in your Will; and for the sake of that love with which You opened for us the doors of Heaven, let your Divine Will descend from those very doors to reign upon earth as It reigns in Heaven. As Scriptures say: “For God has made him [to be] sin for us, who knew no sin; that we might be made the righteousness of God in him” (2 Co 5, 2).